The Almeida Theatre flourishes under the helm of Rupert Goold. 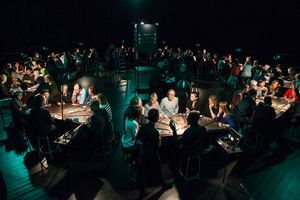 Belgian Theatre collective Ontroerend Goed (Touching Good)'s exciting theatrical immersive experience takes us into a darkened room, sits us on stools around semi-circular wooden tables, away from those we came in with. We have been told to bring some money with us but are reassured that it will be returned at the end of the show. We don't know what to expect but it feels like a casino without the plink plonk of fruit machines. The aim of Artistic Director Alexander Devriendt's show is to plunge us into an interactive world of high finance. He explains in the theatre programme that the British £10 bank notes say "I promise to pay the bearer on demand the sum of ten pounds". He explains that there used to be gold reserves in the banks but now the Euro notes do not give any guarantee and the gold is probably not there. Alexander had thought that when he took a loan to buy a house he was borrowing someone else's savings in the same bank, "But no, they type the pixels on a screen, and then I gave these pixels to the previous owner of the house. And he used the pixels for a trip dispersing them around the world." Black costumed croupiers are in charge at each table, maybe around ten of them with 7 seated at each. Our coins and notes are exchanged for counters, which represent millions, in the colour of our bank, named after the first person at the table. Our croupier or Chief Executive of the bank explains the rules. We place our millions at the top of the table and each throw a dice. Only 1 or 2 loses, the rest win but at the end of the session 20% of our profits will go in taxes. The odds get increasingly more complicated until eventually only 5 or 6 can win. We hear a lot about supporting other members of our bank and how to buy bonds or go short on the bets of another or ourselves, betting on losses. Centrally information is gathered on how each bank is rated from A+ to C-. We are in competition with the other tables or banks as well as each other. We are told what commodities we can invest in, whether electronics or technology or entertainment or many others. As the investments get riskier, the rewards can be larger and we are enjoying the adrenalin of rises and falls in our personal market. Our bank does remarkably well getting the only highest rating of A+ and we start to luxuriate in an excess of counters and bonds from other tables. The problem with success is that everyone wants to get out at the top and cash the highest value banking bonds and will we have enough cash to honour our commitments? We are visited by straight faced staff from other banks who demand payment or want to sell their bonds. They suspend any disbelief. This roller coaster ride through the financial markets was thrilling. Hannah Boer curated us through the banking minefield and it was edgy and fun as we let our winning streak guide out the next gamble. A gong will sound and the central command will announce the ramifications of our last actions. We were there for just under two hours, stimulated and excited by such an innovative foray into world banking. This was a remarkable evening very professionally presented. As the audience left people were asking if our hosts were professional croupiers and there is no better compliment I can pay to these performances. It will of course make you question the ethics of high finance. How much fun is it to play within interactive theatre!